Harvesting tool innovations could mean a 50% saving in labor during fruit harvesting. It could also result in 50% less damage. It is also possible to analyze the number of fruits picked. This analysis can be done in real-time, per hour, day or week via an app. The Dutch company, Munckhof Fruit Tech Innovators presented this automatic counting function for their Pluk-O-Trak. This new idea automatically counts the fruit picked for row and harvester. With this new app, fruit growers can further improve picking performance and yields. The new counting function is available for the high capacity, compact Pluk-O-Trak M-Topline. The apple counting app gives the Pluk-O-Trak 's exact location. It also shows the number of fruits per row or harvester. All this data can be read in clear overviews. It is available on a mobile phone, tablet or PC. The new app aims to help fruit farmers optimize their fruit yields, picking efficacy, and quality difference. The Pluk-O-Trak is a harvesting aide. 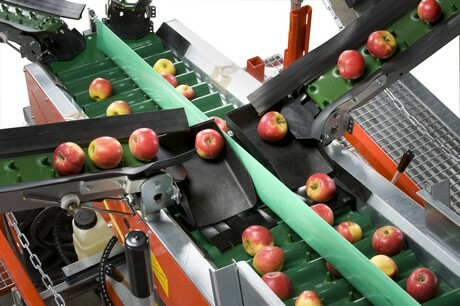 It is used to pick fruit quickly, efficiently and ergonomically. The types of fruit include apples, pears, citrus, and cherries. Harvesters can work with the harvesting system on the ground. They can also use it on horizontal and vertical movable harvesting platforms. It can be used on platforms that reach up to four meters. The harvesters put the fruit on a small, movable conveyor belt. The fruit is then carefully and automatically placed in crates. "With the Pluk-O-Trak, fruit growers save 50% on picking labor. They also have 50% less damage. The Pluk-O-Trak further proves it worth as a labor-reducing, ergonomic aide", says Munckhof's Ingrid van der Sterren. "It helps with pruning, thinning, and working on hail nets. During this work, 35% of labor costs are saved by using this Munckhof harvesting system." The Pluk-O-Trak is suitable for hilly, swampy, and rocky terrein. It is available in sizes for four to six workers. When coupling it to a crate carrier, up to 16 crates can be carried. LED lighting makes it possible to use the Pluk-O-Trak at night too. The Pluk-O-Trak is now available with far fewer V-belts. You can now also get this machine with speed-adjustable electric motor-driven discharge conveyor belts.